GLASS is a psychological thriller sequel about three extraordinary men who live in a world where superhumans don’t exist, but they do. GLASS is a messy movie with bad direction and writing, and a strong romantic worldview with violence and foul language. 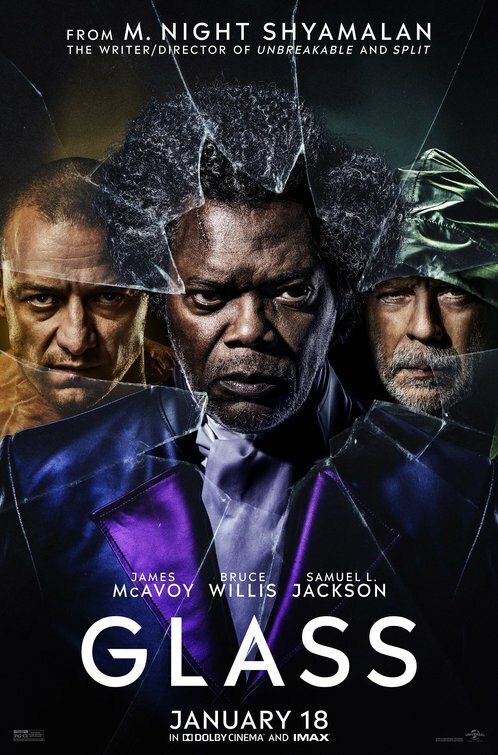 GLASS is a psychological thriller from Writer/Director M. Night Shyamalan, and the third movie in a trilogy that includes the movies UNBREAKABLE and SPLIT. Chalk full of existential musings, GLASS isn’t as dramatically interesting as UNBREAKABLE, nor as thrilling as SPLIT. The movie opens with Kevin (James McAvoy), the unique individual from SPLIT who suffers from multiple personality disorder: 23 personalities to be exact, which altogether are called “The Horde.” Each personality serves “The Beast,” the most brutal of the personalities that gives him super strength and preys on teenage girls, eating their flesh. The Horde kidnapped four teenage girls, which has the entire city of Philadelphia on alert, searching for the missing girls. Meanwhile, David Dunn (Bruce Willis), the super strong former security guard from UNBREAKABLE, has fully embraced his abilities and has become a vigilante. With the help of his son, who’s now a young man, David walks the streets and is able to know who’s good and who’s bad simply by touching them. When David brushes past The Horde on the street, he’s given a vision of the location of the kidnapped girls. He rescues them, but The Beast comes out and fights David. Before their fighting ends, the police show up and capture both of them. David and The Horde are moved to a psychiatric hospital where they’re interviewed by Dr. Ellie Staple, a psychiatrist who specializes in delusions of grandeur, specifically people who believe they have super abilities. Dr. Staple reveals she has a third person under her care, Elijah Prize (Samuel L. Jackson), a mass murderer and comic book expert with extremely fragile bones, but a brilliant mind, who convinced David he has extraordinary abilities. Dr. Staple explains to each of the patients that she has three days with them before they’re put on trial for their various crimes. She’s convinced that they’re disillusioned about their abilities, and that they need to admit to themselves it’s all in their head. Through various arguments and reasoning, Staple makes solid cases. The question is, how long can Elijah, David and Kevin/The Horde believe they have superhuman abilities out of comic books? Meanwhile, Casey Cooke, the only girl who escaped The Horde in SPLIT, finds out that Kevin/The Horde has been captured. Casey has compassion for the Kevin personality, who’s always shut out and taken over by the other personalities. So, she goes to Dr. Staple to try to help. Dr. Staple has taken all the security measures to keep her patients locked up. The Horde is controlled by flashing lights that cause his personalities to forcibly change, David’s room has water hoses set up that will spray him down and make him weak (water is his weakness), and security cameras are set up literally everywhere so they can track Elijah in case he outsmarts the orderlies. Of course, Elijah does outsmart them. He also convinces his new superhuman neighbor, The Horde, to team up with him so they can make the world know that super humans do exist, killing as many people as possible while they do so. Can David stop Elijah and The Horde? Sadly, GLASS is a step back for Director M. Night Shyamalan, who’s made terrific movies like SIGNS, UNBREAKABLE and the box-office hit (but problematic worldview) THE SIXTH SENSE. Even SPLIT managed to be a thrilling movie. As soon as it starts, GLASS suffers from bad dialogue, uninspired exposition, many continuity mistakes, and over-dramatic music. The movie’s biggest directorial flaw in the movie is the major disconnect as to what the audiences knows and feels about the characters and the plot, and what the characters know. For example, at one point viewers are expected to feel fear in a scene, as the music intensifies, but they already know that the person around the corner isn’t the villain, but the hero. Also, later in the movie the main characters begin to question whether they really have abilities, but no one that’s seen the previous two movies thinks that at all: it’s been VERY clear that they do have super human abilities. As a result, GLASS comes off more as a fan film than an actual follow up movie. More than the other movies, GLASS explores the nature of belief in extended scenes of dialogue as the characters delve into the importance, and validity, of comic books. Even though Elijah is the villain, and goes by villainous name Mister Glass, he gives the most explanation as to how comic books connect David and The Horde. In the end he explains the necessity of believing in oneself to find out what you’re truly capable of doing. This is presented in a very emotive, romantic way, but what the filmmaker fails to see is that sometimes believing in one’s own ability results in evil, like it did for The Horde/The Beast and Elijah/Glass himself. There’s nothing innately positive about believing in oneself unless it drives you to a greater goodness. David Dunn is the clear hero and fights tirelessly to protect others from evil, and Casey seeks to see the best in people and show compassion. These positive moral elements, however, are overpowered by Elijah’s romantic hopes of superheroes and villains emerging in society. GLASS does have some strong violence, but thankfully it’s not extremely graphic like many movies in the same genre. Regardless, extreme caution is advised because of the movie’s scary moments, brief foul language and questionable worldview. GLASS is not as good as its predecessor, with some terrible writing and direction. It has a strong Romantic worldview stressing the importance of believing in oneself, even if you’re a villain. There are some positive moral elements, but the bad themes, violence and foul language outweigh the good. Extreme caution is advised for GLASS.